These are our professional series amplifiers. These are special amplifiers designed for the last km. 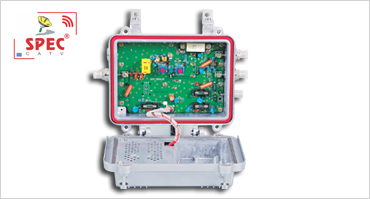 special CATV TF modules packaged in SOT 115 are used as forward channel. It has characteristics of low power consumption, high reliability and excellent performance. Different type of RFIC can be used according to the customer choice. Pre-equalizer circuit is available in our professional series. It is helpful to maintain the slope of the amplifier.